My 25th birthday just passed and I’ve been reflecting on these past 25 years and the experiences I’ve had. I compiled a list of things I’ve learned a long the way that I hope help you, encourage you, or give you something to think on. Within the 25 years that I’ve lived I feel like I’ve lived 100 lives. Although I’m only a quarter of a century old, I have a few pearls of wisdom to share! 1.Never take advice from someone you wouldn’t be willing to trade places with. 2. You get further with honey than vinegar- kindness and gentleness go a long way. 4. Take care of your star player aka YOU- treat yourself to great bags and shoes, a pedicure, or a cupcake! Don’t wait for anyone else to do this for you. 5. Get good at saying no- no to situations and people that don’t feed you emotionally, mentally, or spiritually. 6. They always come back- my cousin told me this when I was 15 and it’s always held true. Boys will always come back even if it seems like they don’t care or have moved on. They always, always come back-but by then you will have moved on! 7. Never stop learning- the end of learning is the beginning of death. 8. Travel is the greatest teacher. 9. Protect your dream- don’t share it with everybody, nurture it while it is still in its infancy. 10. When people walk away from you, let them walk. No one who left is tied to your destiny. 11. As a man thinketh so is he- you have to believe you’re capable for people to see you as capable. 12. There’s a purpose to your pain. What helps me through hard times is knowing that I’m not going through this in vain, but to help others who may deal with the same issues. 13. When people show you who they are believe them. 14. Forgive- Holding on to unforgiveness is like drinking poison and expecting the other person to die. 15. You can tell who people are by the way they treat people who can do nothing for them. I always watch to see how people treat the busser, maid, janitor, etc. 16. God’s not wasteful, He will use your mistakes and turn it around for good. 17. Savor life’s flavors in food and wine. I have so many sweet memories that are tied to food and wine. Just eating a certain meal can take me back to a time when I was abroad that brings me such joy. 18. Learn different languages; it allows you to connect with more people. 19. All things are possible with God- don’t listen to the haters or pessimists, you really can do anything through Him. 20. When you enter a new level in your professional career that brings you into a new room of people, be quiet! You can learn more by listening than talking. Don’t make yourself a fool by blabbing just to be heard or noticed. 21. You know yourself better than anyone else- I’m the only 25 year old me, you can’t tell me how to be me. 22. When you look good, you feel good. Make yourself get ready and dress up, it will make you feel better. 23. Don't be led by your emotions (even the most powerful emotion of all: love), but by your morals. If you stand firm on your morals and values it will keep you from trouble, despair, and regret. I had to learn this the hard way! 24. Stop crossing deserts for people who won’t jump over a puddle for you. 25. Living well is the best revenge. Mi Sueño Winery Celebrates 20 Years! A few weeks ago I had the privilege of joining the Herrera family at Auberge du Soilel Restaurant & Resort to celebrate the 20th anniversary of Mi Sueño winery. This celebration was one of the most magical nights in wine I've ever experienced. The story of Mi Sueño’s inception brought tears to my eyes—it’s one of the most unique and inspiring winery stories ever told. It’s about family, dedication, legacy, and the pursuit of the American dream. The night was filled with stories and toasts from Rolando's family and mentors. Marketta Formeaux of Chateaux Potelle and Warren Winiarski of Stag's Leap Wine Cellars gave insight into what it was like working with Rolando and attested to his incredible work ethic and excellent winemaking skills. It was inspiring and moving to see the support and guidance Rolando received along the way and the close knit relationships he maintained with his mentors. Rolando Herrera, founder and winemaker of Mi Sueño, began as a dishwasher at Auberge du Soleil thirty-five years ago. This moment completed a full circle for Rolando as he remembered his humble beginnings as a night shift dishwasher with dreams of owning his own winery. What started as a dream or "Mi Sueño", meaning my dream in Spanish, is now a reality for the Hererras. Mi Sueño is one of the few California wineries founded and owned by Mexican immigrants. Rolando and his wife Lorena founded Mi Sueño in 1997. Mi Sueño produces between 8,000 to 10,000 cases of wine per year. All wines are bottled unfined and unfiltered. The Herreras have six children that all work at the winery in some aspect. In 2003, Rolando launched an ultra-premium label called Herrera Wines, with each bottling named after one of the children. Lorena comes from a strong farming background. Her parents Reynoldo and Maria Robledo, own and farm over 350 acres of vineyard land in Napa, Sonoma and Lake Counties. Both Lorena and Rolando share a deep understanding of the importance of grape growing in the outcome of wine quality so they chose to manage everything from vineyard to bottle themselves. They farm 40 acres of estate vineyards in Oak Knoll, Coombsville, Carneros, Russian River Valley, and Sonoma Mountain. In 2016, they purchased a property on Mt. Veeder that they will use for the Herrera wines and hopefully build a winery and tasting room on one day. New Rap & New Wine: Chance the Rapper, "Best New Artist & Best Rap Artist of 2017"
For those wondering, "Same Drugs" isn't actually about drugs--it's about past lovers changing, choosing different paths in life, and now having dissimilar mindsets than the other. We all evolve daily and this song paints a beautiful portrait of what it feels like to experience that change with someone you once loved and knew intimately. It's the story of transformation from being deeply familiar to becoming strangers. To match the vibrant and distinctive music of "Coloring Book", I chose REVEILLE's 2012 Ultra-Violet Cotes du Roussillon blend of 70% Syrah, 15% Grenache, 10% Carignan, and 5% Mourvedre. The owner and winemaker of REVEILLE, France Crispeels, is a first generation winemaker who comes from an eclectic background of the arts including architecture and writing. Ultra-Violet is made from old vines on a high altitude vineyard in the Vallée de l’Agly of Roussillon. The vines are farmed organically, hand harvested, and partially destemmed. The wine is fermented with native yeasts and aged in concrete tanks for 15 months. This wine reminds me of black olives, plum skin, barnyard, and rhubarb. Without a doubt, this is a natural wine; it has all the funky nuances you would expect. The French fashion house, Balmain, and Kanye West teamed up to create a campaign based on the song ‘Wolves’ from his album “The Life Of Pablo”. Neither party has ever done a collaboration like this before. This is the first of its kind- merging music and fashion in a brilliant and revolutionary way. Each model, outfit, movement, sound, and emotion contributes to the video in a powerful way. The video stars Kanye, Kim Kardashian, Vic Mensa, Sia, and top models like Joan Smalls, Jourdan Dunn, and Alessandra Ambrosio dressed in Balmain couture. This video really inspired me because Olivier Rousteing (design director for Balmain) and Kanye West did something “out of the box” for their industries that I want to see happen within the wine world. They created a new way to connect one artistic industry to another by pairing fashion with music; in the same way I hope to see music and fashion paired with wine. For many years we’ve only focused on food and wine pairings but no one has spoken about wine in relation to other aspects and interests in our lives. That’s why I’m so excited to be working with I Like This Grape to promote modern wine culture through fashion, film, and music. It’s time for this industry to evolve and reach the newest generation of wine drinkers by making wine relatable. Push this Balmain and Kanye West collaboration further and pair it with Bérêche et Fils Brut Reserve Champagne from Montagne de Reims and Vallée de la Marne. The assemblage consists of 30% Chardonnay, 35% Pinot Noir and 35% Pinot Meunier including 30% of reserve wines from previous vintages. Bérêche has been a family owned Champagne House since 1847. They do not use commercial yeasts to start primary fermentation. The wine is aged on the lees, unfiltered, and manually disgorged. The Brut Reserve Champagne tastes of baked red apples, biscuit, honey, toast, and yeasty flavors. I chose a grower Champagne to pair with Balmain to continue on the exclusive, French, luxury theme. What else would you pair with crystal embroidered couture other than something sparkling? The song ‘Wolves’ is dismal, painful, lonely, and regretful. 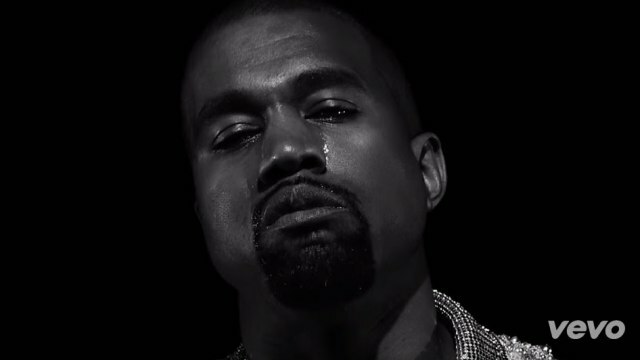 Tears are seen on Kim and Kanye and all the models. It tells of heartbreak, regret, sadness, and feeling lost. Like Napolean said, Champagne is deserved in victory and defeat. While watching this video I hope your only pain be Champagne. I'm beyond thrilled to announce that I'm the newest Staff Writer for I Like This Grape, a digital wine magazine promoting modern wine culture through fashion, film, food, and music. I'll be answering wine questions every Wednesday on my weekly column #SommNextDoor. Send in any questions you have about wine to cheers@ilikethisgrape.com or Twitter and Facebook. I'm so excited for this journey and I hope you'll join me over at I Like This Grape. We have so much new and interesting content and write about wine in a way you've never read before. If you liked my Rihanna x Sake post and The Life of Pablo Pairings check out #VINOMUSIC for other creative music and wine pairings. Thank you all for the support and for following me on LadySomm.